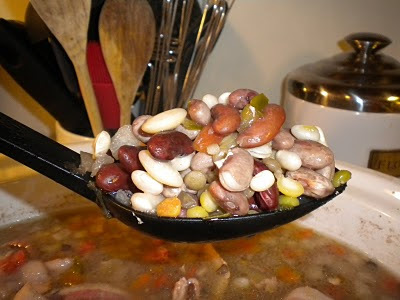 until this past week, i had never made "a pot of beans". it's not that i don't like beans, it's just that it never really occurred to me to make them. my mom makes them and my grandmother makes them, i just never really thought about it. 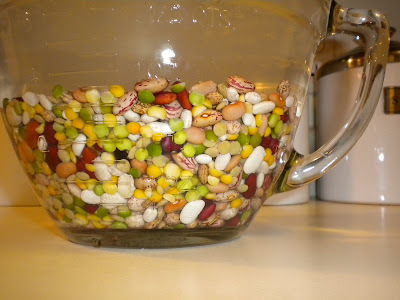 a couple of months ago, while at the grocery store with my mom, i mentioned that i thought beans would be a good meal for the plan i was on (the same one i am trying to be on now). they count as a protein and a vegetable (i have a hard time fulfilling my required veggie servings every day). so we got some 15 bean soup...while not completely healthful (adding bacon or ham hock to things tends to make them less healthy!!) i thought it would be perfect for a cold winter night!! i must have read the directions 15 times...the first thing was that you needed ham hock....ok, i know that is a pretty standard thing in most southern households, but i do not believe i have ever had ham hock in my house...so i always stopped there. then the other day i remembered i had a pack of bacon in my freezer...that's kind of like ham hock, right? i went with it, and it wasn't too bad!! 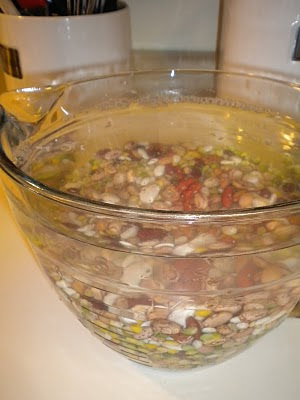 this is the beans soaking - i thought they were so bright and colorful!! who knew beans could be so beautiful! 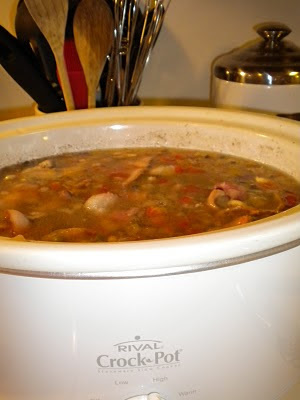 i let them soak overnight, drained them and put them in the crock pot the next morning....with some bacon, some frozen chopped onions and some other seasonings. this is while they were cooking...and making my house smell wonderful!! yum, yum! unfortunately they were not near as bright and beautiful by the time they got done cooking, but they sure tasted good! i may have to try this again. I love that you gave me step by step instructions! Ha! I have never made beans either. Looks good.